When you think of arthritis, what comes to mind? Many young people have the misconception that arthritis only affects the elderly or men and women who with their hands, turning wrenches, working in the garden, or doing needlework. But arthritis can actually affect joints outside of your hands, that’s why ankle, knee and hip replacements are so popular these days. But arthritis is not just for the older these days, no, far from it. Arthritis can set in at a younger age than you might expect. If you have ever worn high heels, you know that they aren’t exactly known for comfort. A day of walking in high heels can reduce even the proudest strut to a hobble. When you finally remove your shoes, you might be massaging your sore feet and tight calf muscles for hours. If you prescribe to the ole “pain is beauty” school of thought, your heel habit could have long-lasting consequences. A recent Stanford study found that the pressure bearing on the knees of heel-wearers erodes the protective cartilage around the knee. Think of this cartilage as a shock absorber – when it wears down, it can no longer cushion your bones from the shock of each step. This increases the risk of osteoarthritis in the knee. During what probably felt like a very awkward fashion show, the researchers asked women to walk through a scanner while wearing flat shoes, 1-½ inch heels, or 3-½ inch heels. The research team found that the heels forced the women’s knees into abnormal positions, causing the joints to act just like they were aged or damaged. We know it’s not easy to give up on heels. Women often wear heels because they look great and complement their outfits, but many women also wear them in order to look taller, more professional, and be taken seriously in the workplace. However, if you’re wearing heels regularly and experiencing pain, don’t think you can just sweep the problem under the rug with pain relievers. Osteoarthritis is a degenerative condition, and when there is almost no cartilage left in your knee, OTC pain meds won’t fix it. Steroid injections may work for a time, but the only permanent solution for osteoarthritis is surgery. Some women are seeking out surgery as early as their 40s. The bottom line is that high heels just weren’t designed with women’s health in mind. As the heels get higher, the list of problems gets longer. In the ultimate irony, beautiful high-heeled shoes can actually produce some of the ugliest deformities of the toes. Heels have also been notorious for causing both bunions and hammertoes. Both can form when feet are tilted forward and stuffed into pointy toe boxes. Three-inch heels can cause Achilles tendonitis. Many patients also suffer from severe neck, back, and lower-back pain as a result of wearing heels regularly. Heels throw the body off-balance. Your muscles and skeleton were simply not built to sustain the posture needed to keep your body upright while wearing heels. If you must wear heels, take breaks. For heels of more than 2 inches, take a 30-minute break every two hours to either sit down or go barefoot. Exercise your legs regularly to keep the soft tissue in your knees strong and healthy as a preventative measure against osteoarthritis. If you would like more information, please to call us at (877) 989-9110 or visit us at www.footankleinstitute.com. 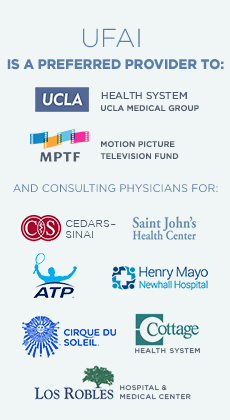 University Foot and Ankle Institute has 9 state-of-the-art locations throughout the greater Los Angeles area.